Innsbrook’s PGA Head Golf Pro Kevin Corn created, implemented and currently runs the Junior Golf Program at Ranken Jordan. Me: Hi, I'm Kevin. Are you ready to play golf? Junior Golfer: I'm in my hospital bed, I can't play golf. Me: If you want to play, I'll show you how you can hit the golf ball. Junior Golfer: Really? Even though I'm in my bed and have to lay on my stomach I can still play? Me: Of course you can! Junior Golfer: Ok, if you think I can hit the ball from here I'll give it a try. Over the years of writing this blog I have shared several conversations that I have had with patients which are much like the one above. 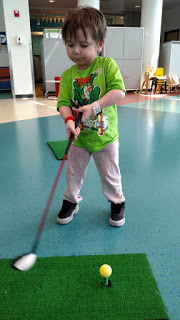 For many of the children, getting to Ranken Jordan is the first time they have been told that they can do something like play golf. I always enjoy these conversations because they serve as a starting point of showing the children what is possible for them. Who would have thought that a child laying on their stomach in their hospital bed could hit golf balls? To take it a step further, who would have thought that same child would also learn how to tee up their own golf balls while laying face down in their hospital bed? After having that initial conversation with our new junior golfer and starting to hit golf balls, things were going so well that I decided to teach them something else. At Ranken Jordan we use the Almost Golf Balls because they do not break glass or skin and are very limited flight. They are also much lighter than regular golf balls. 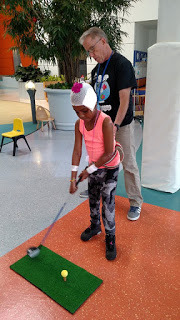 Because of that, the golf balls can be rolled up the rubber driving range tee using a golf club so that nobody has to bend over to tee it up (however we do make many of the kids bend over to tee up the golf balls for the therapeutic effect). Following several very good golf shots, I showed our new junior golfer how to do just this. It did not take much practice before teeing up golf balls from the hospital bed was no big deal! The smiles, laughter, and fun did not stop for well over an hour! Imagine if you will walking into a pediatric hospital as a visitor. As you walk past the reception desk, you see an indoor playground with children hitting golf balls off the windows on the other side of the playground. You look further and see that one of the children is flat on their stomach in a hospital bed, has scooted up to the edge, and with arms hanging off the end of the bed is hitting golf balls. You stand and watch for a few minutes and that child is also teeing up their golf balls before hitting them. Seems perfectly normal, correct? At Ranken Jordan things like this are perfectly normal. I feel incredibly fortunate to be able to spend some time with the kids every week and always leave knowing they did far more for me than I could ever do for them. However the best is yet to come -- I cannot wait until Ranken Jordan National Golf Links is open for the kids to enjoy! 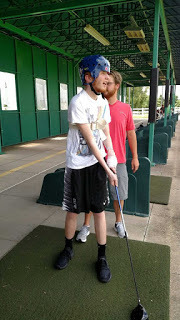 To view more of Kevin’s inspiring stories, visit http://rankenjordangolf.blogspot.com/.